In the 1930s, brothers Siegfried and Walter Günter were pushing the limits of aerodynamics as they designed aircraft for Heinkel Flugzeugwerke in Germany. Perhaps the ultimate expression of their aerodynamic beliefs was the Heinkel He 119. The Günter brothers and Ernest Heinkel envisioned the He 119 as an unarmed, high-speed reconnaissance aircraft or light bomber. Heinkel He 119 V1 prototype with the hastily installed radiator to augment the evaporate cooling system. Work on the He 119 began in the summer of 1936 as a private venture funded by Heinkel Flugzeugwerke. The aircraft appeared to have a fairly standard layout as an all metal, low-wing monoplane with retractable gear. However, the very streamlined fuselage hid the He 119’s unorthodox power arrangement. To achieve the low-drag necessary for high-speed operations, the engine was buried in the fuselage, just behind the cockpit and above the wings. An enclosed drive shaft extended forward from the engine, through the cockpit, between the pilot and co-pilot, and to the front of the aircraft where it drove a 14 ft (4.27 m), metal, variable-pitch, four-blade propeller. No engine produced the power needed for the He 119, so two Daimler-Benz DB 601 engines were placed side-by-side and coupled together through a common gear reduction. The DB 601 was a liquid-cooled, 12-cylinder, 60 degree, inverted Vee engine with a 5.91 in (150 mm) bore and 6.30 in (160 mm) stroke. When coupled, the 24-cylinder engine was known as the DB 606; it displaced 4,141 cu in (67.8 L) and produced 2,350 hp (1,752 kW). The inner banks of the DB 606 were pointed nearly straight down and exhausted under the aircraft. The side banks’ exhaust was expelled just above the He 119’s wings. The Daimler-Benz DB 606 engine was comprised of two DB 601 engines joined to a common gear reduction. The DB 606 engine in the He 119 was to be cooled exclusively by surface evaporative cooling, where steam from the heated coolant was pumped under the skin of the wing’s center section. Here, the steam would cool and condense back into liquid. The liquid was then pumped back to the engine. However, during testing the system proved to be inadequate, and a radiator was added below the fuselage, just before the wings. The first prototype had a fixed radiator that was rather hastily installed. 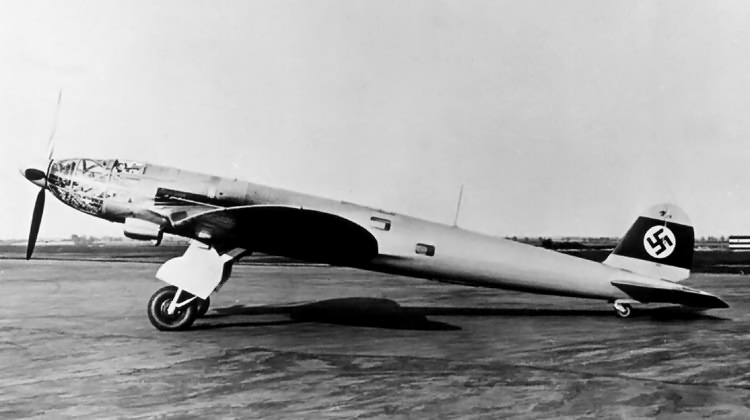 The subsequent prototypes included an improved radiator that was extended during low-speed operations but was semi-retracted into the fuselage as the aircraft’s speed increased. 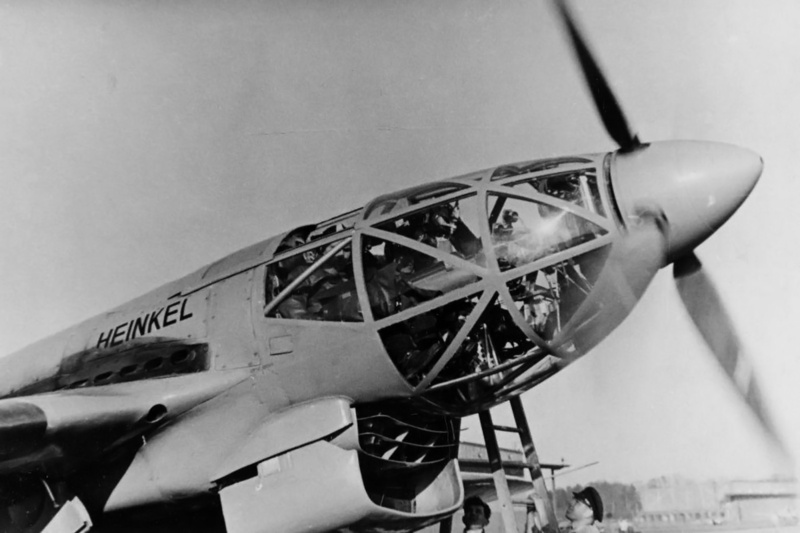 The He 119’s cockpit formed the nose of the aircraft. The cockpit was entirely flush with the 48 ft 7 in (14.8 m) fuselage and was extensively glazed with heavily framed windows. The pilot and co-pilot accessed the cockpit by separate sliding roof panels. In the aft fuselage were provisions for a radio operator and a ventral bay for cameras. Another bay for either large cameras or a maximum of 1,200 lb (1,000 kg) of bombs was located in fuselage, just aft of the wing spar. A good view of the He 119’s glazed cockpit is provided in this image. Most sources state this aircraft is V4, but it possesses the exhaust ports of V1. Note the extended radiator. The He 119 had a wingspan of 52 ft 6 in (16 m). To provide for proper ground clearance, conventional main landing gear would have been too long to fit in the inverted-gull, semi-elliptical wing. A telescoping strut was devised that would collapse as the gear retracted. This allowed the gear to fit within the wing and also extend to provide the needed ground clearance. Heinkel kept the He 119 a secret during construction, and the first prototype (V1) flew in June 1937 with Gerhard Nitschke at the controls. Even with the bulk of the added radiator, the aircraft achieved 351 mph (565 km/h), which was faster than fighter aircraft of the day. This speed validated Heinkel and the Günter brothers’ position that the fast bomber did not need to be armed. However, when the aircraft was revealed to German officials, they insisted the aircraft be armed with upper and lower guns operated by separate gunners. German officials did allow the continued experimentation of the aircraft; at this point, the aircraft was officially designated He 119. The addition of the guns lowered the aircraft’s speed, and it appears that only the upper gun was included in other prototypes, housed under a sliding panel. Heinkel He 119 V2 with windows in the rear fuselage for the radio operator. Reportedly, this is the last He 119 built with the semi-elliptical wing. It is at this point that sources disagree on the He 119’s history. One theory is that the second prototype (V2) first flew in September 1937, followed by the fourth prototype (V4) in October 1937. The He 119 V4 set a speed record on 22 November 1937 and was destroyed in a follow-up attempt on 16 December. A total of eight aircraft were built; the seventh (V7) and eighth (V8) were purchased by and subsequently shipped to Japan. The other theory, supported by German Heinkel expert Dr. Volker Koos, is that the V1 was prepared (which included the installation of a new radiator as used on the subsequent prototypes) for the record flight. The V1 flew the record flight and crashed during the follow-up attempt. The first flight of V2 was in 1938, and V4 first flew in May 1940. Most likely, only four aircraft were built, and V2 and V4 were shipped to Japan. Side view of the He 119 V3. The updated wing used on the V3 and all further He 119 aircraft can be seen as well as tail modifications to increase the seaplane’s stability. All sources agree that the He 119 carrying the registration D-AUTE made the record flights. 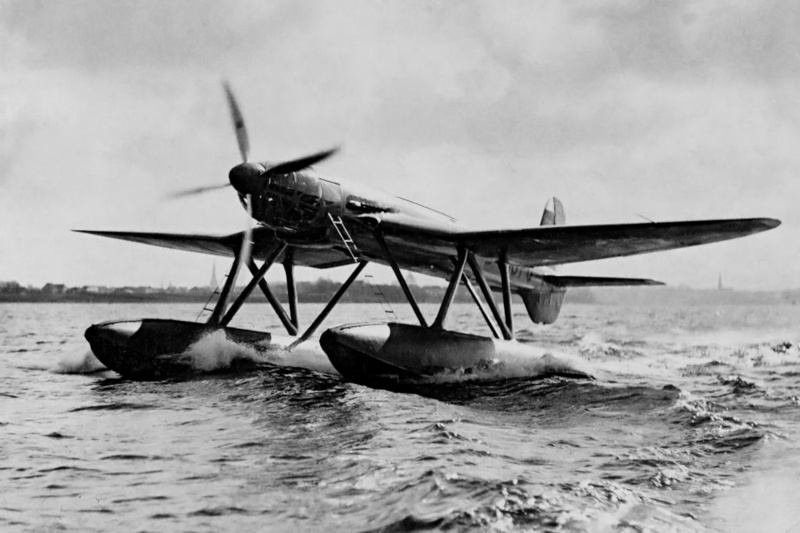 The third prototype (V3) was first flown after V4 because V3 was built as a seaplane. All prototypes from V3 on were built with a new wing that had a straight leading edge and a slightly reduced span of 52 ft 2 in (15.9 m). After careful examination of various photos, it appears that the He 119 registered at D-AUTE had the semi-elliptical wing as used on the first two prototypes. It also appears that the exhaust ports above the wing on V1 were unique and at an angle, with each port slightly higher (relative to the fuselage) than the port preceding it. All other He 119s had exhaust ports in a straight line relative to the fuselage. D-AUTE appears to have the ports as seen on V1. Based on the information available, it seems more likely that V1 did indeed make the record flights. Sadly, given the secrecy under which the He 119 was built, the propaganda subterfuge surrounding the record flights, and the destruction of German documents during World War II, the exact aircraft identities as well as the number built may never be definitively known. 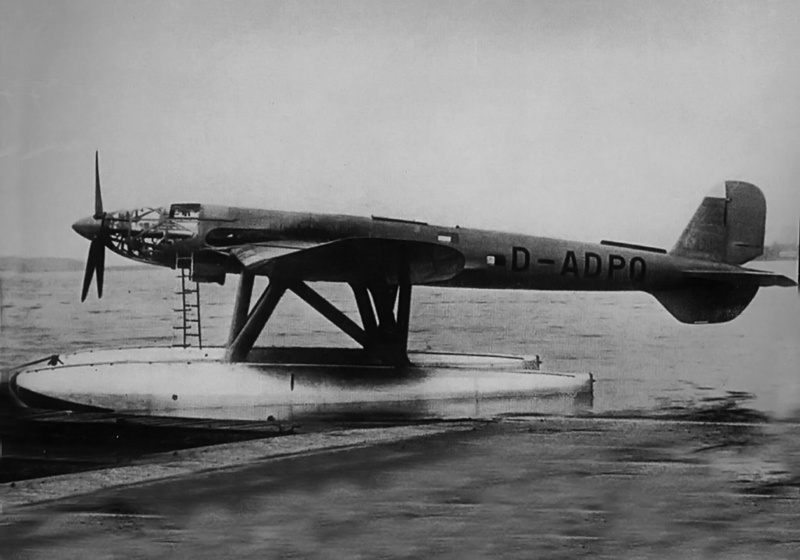 The Heinkel He 119 V3 seaplane taxiing under its own power. This aircraft was to be used on an attempt to set a new 1000 km (621 mi) seaplane record, but such plans were cancelled after the other He 119’s crash. Regardless of the specific airframe, on 22 November 1937, the He 119 set a world record for flying a payload of 1,000 kg (2,205 lb) over a distance of 1,000 km (621 mi). For propaganda purposes, the He 119 was labeled He 111U and also He 606. Due to weather, the He 119 was forced to fly lower than anticipated which reduced its airspeed. Even though the He 119 set the record at 313.785 mph (504.988 km/h), the speed was seen as a disappointment that did not represent the He 119’s true capabilities. Indeed, the record was broken about two weeks later by an Italian Breda Ba 88. A follow-up flight to reclaim the record occurred on 16 December 1937. With over half the distance flown and the He 119 averaging just under 370 mph (595 km/h), the DB 606 engine quit. The pilots, Nitschke and Hans Dieterle, attempted an emergency landing at Travemünde but hit a drainage ditch. The He 119 was destroyed; Nitschke and Dieterle were injured, but they survived. The engine failure was a result of a faulty fuel transfer switch. After the crash, Heinkel was ordered not to attempt any further record flights with the He 119. Many sources identify this aircraft (D-ASKR) as the He 119 V2. Interestingly, the wing root intake for the supercharger and lower lip of the radiator do not match those found on other images of V2. The features do match those found on V3. Other He 119 prototypes took over the test flights. He 119s with the new wing demonstrated a top speed of around 370 mph (595 km/h) and a range of 1,865 mi (3,000 km). Despite the floats, the He 119 V3 seaplane had a top speed of 354 mph (570 km/h) and a range of 1,510 mi (2,430 km). The V3 aircraft also had a ventral fin added to counteract the destabilizing effects of the floats. Unfortunately, the German authorities did not have any interest in producing the He 119 in any form because of its unorthodox features. Reportedly, some of the remaining aircraft served as test-beds for the DB 606 and DB 610. The remaining He 119s in Germany were scrapped during World War II. Late in 1938, the He 119 was shown to a Japanese Naval delegation that expressed much interest in the aircraft. In 1940 the Japanese purchased a manufacturing license for the He 119 along with two of the prototype aircraft. These aircraft were delivered via ship to Japan in 1941 (some say 1940). The aircraft were reassembled at Kasumigaura Air Field, and flight tests occurred at Yokosuka Naval Base. During an early test flight, one of the He 119s was badly damaged in a landing accident, and it is believed the other He 119 suffered a similar fate. 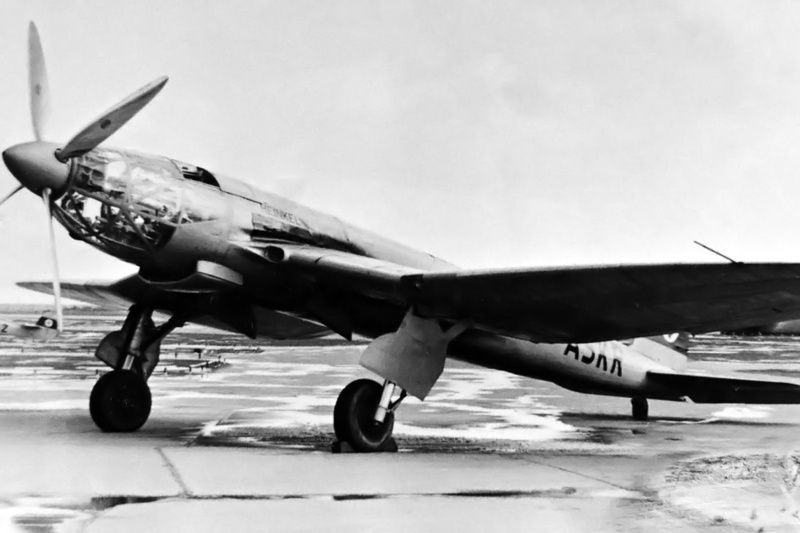 While it was not put into production, the He 119 did provide the Japanese with inspiration for the Yokosuka (Kugisho) R2Y1 Keiun high-speed reconnaissance aircraft. 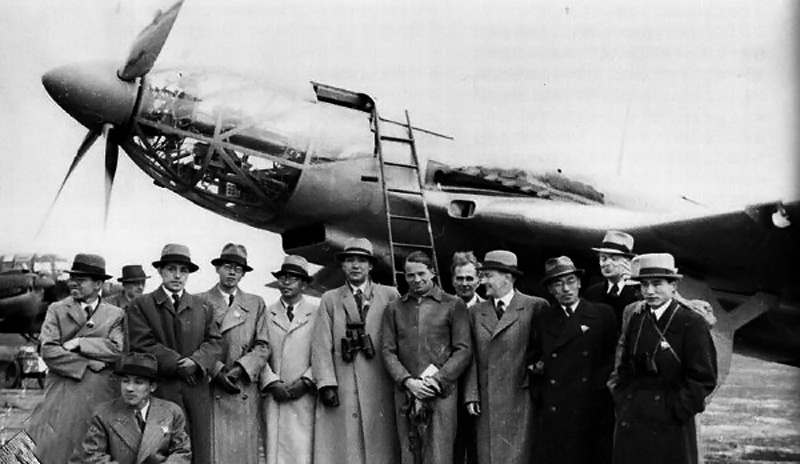 The Heinkel He 119 with the Japanese Naval delegation. The sliding roof panel for the pilot’s cockpit access can clearly be seen. Note the differences with the wing root intake and lower lip of the radiator compared to the D-ASKR aircraft. This entry was posted in Aircraft, Between the Wars, World War II on 5 December 2012 by William Pearce. Very interesting update to this page, which I have not looked at for a while. Have you at last found a photo of the famous He-119 “V4?” My guess is no. I think D-ASKR was assigned to “V-2” (Although a modeler’s site, see: http://www.petersplanes.com/avions/he115-119/He119.htm). I have been studying the photos of He-100s sent to Russia and photographed by the Russians after arrival in the USSR. Supposedly the Germans sold the Russians the surviving prototypes (V-series) machines, yet they all had the full on “D-1” updates including the distinctive horizontal stabilizers, bugled canopies, final form of the evaporative cooling system with retractable radiator, etc. Considering that the supposed production models were either kept in Germany or sold to the Japanese, my only conclusion is that Heinkel updated its export machines to the latest standard before delivery, at least for the He-100s going to Russia. I suspect they did something similar to the machines going to Japan, He-100 and He-119. Presumably, the Japanese would have also wanted the latest standard available. To me, the photo above is “V-2” updated with the final wing root, supercharger intake, and retractable radiator design. The leading edges are clearly curved. I have come to the conclusion that post-war historians are jumping to the wrong conclusion about the German wartime “Versuchs” system. It may literally translate into “trials,” but it really means “experimental version.” Again, looking back at the He-100 story, the original machine, was initially designated “V-1” and had an inadequate vertical stabilizer. I think it unlikely that Heinkel simply set it aside or scrapped it because of that. Surely, it was modified with a larger fin and rudder, especially since there seems no reluctance throughout the entire German aircraft industry to remanufacture things. At that point, it was “V-2,” or the second version of the aircraft being used for experiments or development. There may even have been more than one machine built to the V-2 standard. Similarly, one machine may have flown in multiple “Versuchs” versions/numbers. Considering no contracts were pending, did Heinkel really build a brand new aircraft just to prove that it could contain and fire cannons, or did he just modify one of the existing machines to include that armament and then assign it a new “Versuchs” number? I suspect the latter. So, the photo you have posted seems most likely the second aircraft originally built as “V-2” but updated with some of the later developed features prior to export to Japan. Does that make it “V-4?” Maybe, but it still has its original wing, and I think everyone agrees with you that D-AUTE was the first built prototype updated to the fourth experimental version at the time of its speed record attempts. Does that make D-ASKR “V-5?” Maybe, and that would explain why history records up to eight different “versions” of this fascinating machine. I am starting to think that only three of the very expensive He-119 aircraft were ever built. My suspicion is that the third machine was eventually converted from a float plane demonstrator back to a land based aircraft (that the floats were a modification added in an attempt to sell the machine as a replacement for the He-115, and removed when that effort did not bear fruit). Once returned to its original land plane configuration, the third aircraft was probably the second of the two sold the Japan (again offering further explanation for why the second machine was updated to a similar configuration), so maybe the third machine, so modified, was “V-5” and the above photo is actually “V-6?” I suspect no one will ever know, but I’m sure Heinkel was keen to recoup some of his substantial investment in this commercially failed design, and sales are much more profitable than scrap! That would also explain the complete lack of photos of any He-119s in Germany after 1940. If even a couple were retained for experiments, you would expect to see them in the background in a photo or two. It’s sad that so little is known about his very important airplane. It’s initial promise was directly responsible for the design decisions made for the (fortunately) ill-fated He-177. That heavy bomber would have been quite a different aircraft had the problems it developed in service shown up on the He-119. I guess highly trained factory technicians could keep the DB-606 engines running well enough during the short, relatively low altitude flights the prototypes made to give the designers confidence to dispense with a firewall. That engine sat only a few inches from the crew in the He-119 in a very tightly cowled/confined space, so Hertel and the Gunthers apparently did not think twice about the similar He-177 installation. As far as I can tell, the He-119 engine was cantilevered/mounted directly to the face of the main wing spar, again exactly as done in the He-177. The war might have been very different had the DB-606 engined He-119 proved unreliable and prone to catch fire. The ‘He-177B” or “He-277” would have been the initial version, and it could have made a significant difference in both German’s eastern and western fronts had it been available in the time frame initially planned for the He-177. Thank you for your excellent comments and sound points. I have updated the captions to be less certain about the D-ASKR aircraft. I certainly agree that it’s a shame so little is known about this aircraft. Thanks. Really enjoy and appreciate your work here. Ah, the infamous Ba 88, which ended up being parked as decoy aircraft on Italian airfields due to its abysmal performance. Happened to re-visit this site today. In the last year, a few more pictures of the He-119 have filtered onto the net, including some construction photos showing the engine bay (A typical late Heinkel system without conventional engine bearers and using stressed fuselage members to support the engine – one of the exhaust stacks on each side actually ran through an inverted horseshoe former that supported the rearward motor mounts on both sides of the fuselage). The photo you originally identified as “V-4” is definitely “V-2,” The one you posted is actually a cropped version of a larger image, which shows the wing tips and confirms it has the V-1, V-2 wing. However, the lower picture of an He-119 with the Japanese delegation, may not be V-2 at all. The landing light shown on the port wing does not appear to be a feature on the early curved wing. I have not yet seen a good enough photo of V-3 on floats to identify whether it had such a landing light. Also, the machine in the bottom photo seems to have a smaller and fixed radiator inlet instead of the variable/retractable system seen in every other photo I have seen (including the one of “V-2” above it). The lowest photo also shows a unique system of exhaust stacks rising up along the side of the fuselage. the first two machines built certainly did not have that. The side view of the early V-2 is misleading – the pitot tube obscures the exhaust area and makes it appear that the stacks are lined up in a row. The newly available construction photos show that would not have been possible without modification to the underlying structure because a stringer follows the wing profile through that area necessitating the V-1 style “rising” exhaust layout. That same stringer terminates at a tubular “V” brace that is part of the cockpit truss area, which would also need to be adjusted to get a “straight” exhaust profile. I conclude that that last photo above is either a significantly rebuilt “V-3” no longer on floats or a subsequent machine. Maybe Heinkel built more than three of these things after all, but if I had to bet money and the correct answer was actually known, I would still bet only three were ever built, and they were modified over time. Thank you for the additional info and your kind comments. Trying to determine the true history of the He 119 is vexing. There is a drawing supposedly of V4 that shows the landing light and what appears to be a fixed radiator. This would match the aircraft shown to the Japanese. But, is it truly a fourth aircraft or just a modification of another? I too doubt the aircraft the Japanese are inspecting is V2, and I think that four aircraft may have been built. Perhaps some documentation will be discovered soon that will finally give us the clues we need to definitively identify each airframe. We will keep at it! The concept can be compared to the Mosquito. Perhaps it could even and also been made into a night fighter before the He-219!? One wonders if that cockpit would have led to problems in combat. Maybe not. A very spiffy looking ship, though I think the He-100V3 is my favorite of the Heinkels on this score. Re V-numbers. There were opposite cases — V numbers reused on new airframes when the original was lost.